The tournament is bramble format with a shotgun start at 11:00 am. The golf course at The Ridge Club is a par 71- Robert Von Hagge design that offers golfers of all abilities a different challenge. The greens are consistently voted as some of the best on Cape Cod. The course features a variety of picturesque holes, highlighted by 16, 17, and 18 where water comes into play. The par-3 17th is the only island green on Cape Cod. In addition to the opportunity to play on this stunning course, participants will be provided with lunch and a giveaway bag. Beverages will be available for purchase from the drinks cart on the course. Mulligans and raffle tickets are available for purchase at registration. Afterwards, there is a 19th Hole Reception, dinner, and auction, concluding no later than 7:30 pm. 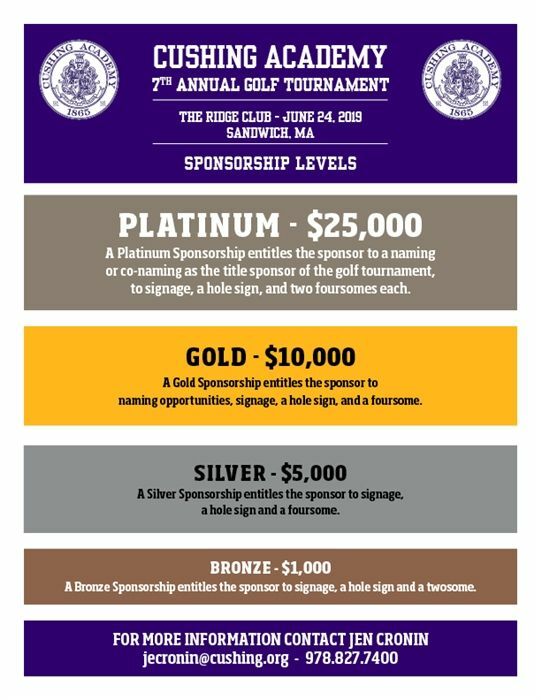 You can support the golf tournament through sponsorship and participation. All money raised by the tournament and auction support the Cushing Academy Annual Fund and Cushing’s Ice Hockey Programs. The tournament fee for a single player is $350.00. Federal law permits you to deduct as a charitable contribution only the excess, if any, of your gift over the value of items you received in exchange. If you have questions, contact the Alumni and Parent Relations Office at 978-827-7400 and alumniprograms@cushing.org. On Monday, June 25, 2018, nearly 100 golfers came to The Ridge Club in Sandwich, Mass., to have some fun on the links while supporting the Cushing Academy Annual Fund and Cushing’s hockey programs. Click here to register as a single player, to register a foursome, or for more information including playing fees.